A serious problem for some gardens is the risk of the weight of snow bringing down tree limbs or sections of large plants, especially evergreen plants where there are leaves to collect the snow landing on them. The weight of snow on the tops of greenhouses, poly-tunnels, sheds and cold-frames might also need thinking about if you don’t want a nasty surprise. Hopefully, you can ignore this advice either because the coldest you get is +25°C, or your shed has a steel-reinforced roof. We’re OK for our garden and don’t need to worry about the weight of snow so much (we simply don’t get that much), but seeing the bamboo in the garden bent-double just brought this to the front of my mind. 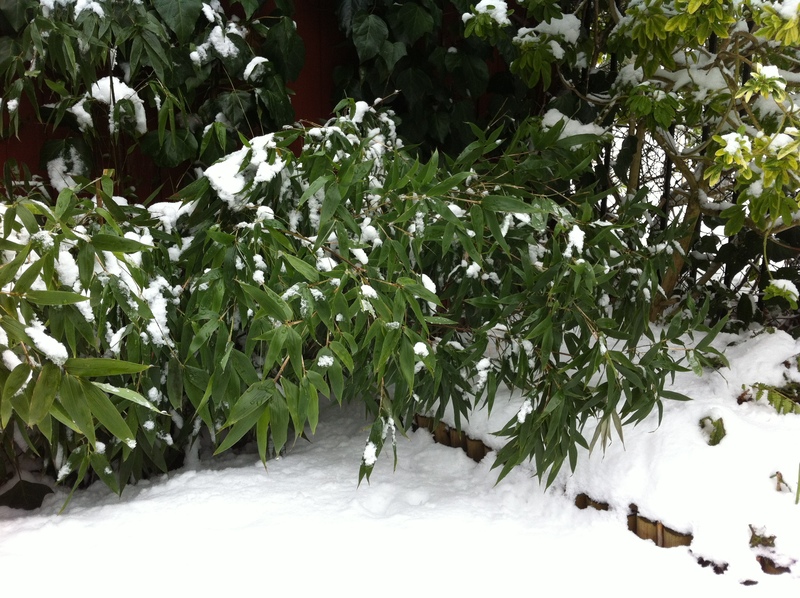 Luckily, bamboo is one of the most flexible and elastic plants there are and although it looks as though it will now have to start growing sideways, it will actually pick itself up after the snow goes.